The term “rainmaker” in business was coined for those who in short “make it happen”. Those who strike the deals and create more business. Our annual list of Scotland’s Top 50 Rainmakers always creates a bit of interest and debate. 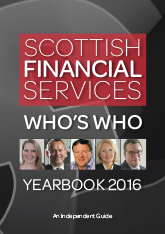 Chosen by the Yearbooks editorial team which includes highly experienced and renowned business journalists, the 2016 list is our assessment of who we feel will be the key individuals who will really make a difference to Scotland’s business and industry this year.